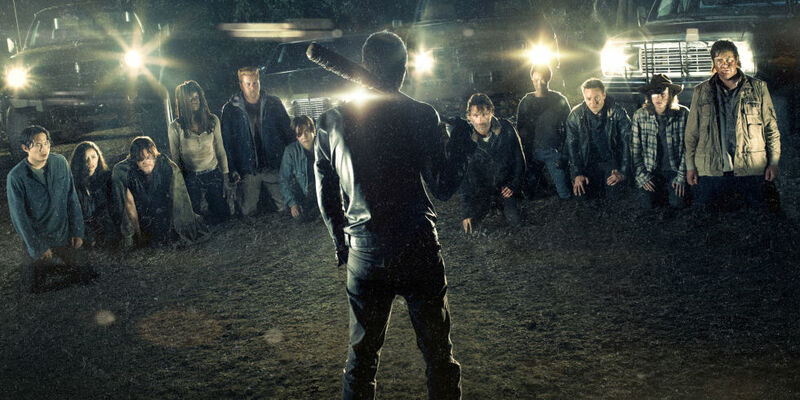 Batter Up on Walking Dead – Who strikes out? It’s the greatest cliffhanger in the history of what is currently television’s most popular (and best) show. Not since “Who Shot J.R.?” over 36 years ago have home viewers been faced with such a seemingly endless wait for an answer to a season-ending shocker. Whereas everyone knew it was J.R. who got shot on Dallas back in 1980 – it was the perpetrator’s identity that kept people guessing – on The Walking Dead‘s season 6 finale, fans were left knowing that a beloved character was going to die, they just didn’t know who. Now, finally, on October 23rd, the agonizingly long six month wait is over. Eleven characters were left kneeling before new villain Negan (played by Jeffrey Dean Morgan) and his lethal barb-wire wrapped baseball bat he affectionately has named Lucille. That last episode ended with Negan choosing one and bashing him/her over the head in order to send a message to the rest that he was not to be messed with. As the bat comes crashing down, we see it from the victim’s perspective, as blood fills the camera lens. Miraculously, whoever was clobbered sits back up, forcing a surprised and impressed Negan to exclaim, “taking it like a champ!” Negan then resumes swinging for the fences and we are left knowing beyond a doubt that the recipient in no way survived. When The Walking Dread returns on Sunday, we’ll ultimately find out who that unlucky soul is, as the remainder of the group is changed forever. So, who do you think it is? What person’s death might reverberate throughout the rest of the group the most? Who might be able to withstand that initial whack? To what lengths would the producers go to shake up the group and shock audiences? The Gore 4 chimes in with their thoughts and predictions, and we welcome anyone else to let their speculations fly in the comments section below. Batter up! This Gore 4 member is going to throw his two cents in regarding the resolution of Season 6’s cliffhanger. The big question — and I mean the BIG question — isn’t who’s going to win the upcoming presidential election, but who Negan killed at the end of Season 6. Why am I throwing in my two cents? Because I’m generously giving a penny for each of Negan’s kills. That’s right, I’m guessing Negan will off two — yes, folks, TWO — characters in the first episode of season 7. Abraham — A) He elevated his torso and straightened his back in a gesture of defiance when he was on his knees in front of Negan. Negan perceives Abraham’s strength from that gesture and doesn’t want to deal with a survivor who’ll be both a grandstander and perpetual troublemaker. B) He violated an unspoken moral code by cheating on and dumping Rosita. Lucille is cosmic karma for that transgression. Glenn — A) This is the moment when he bit the big one in the comic. B) By all rights he should’ve died when he dumpster-dived not too long ago. C) Lauren Cohan broke down and cried at New York Comic Con recently. Most female Dead stars who break down and cry during interviews do so because they’re getting cut from the show or because someone they’re professionally close to is getting cut from the show. Although Lauren Cohan has somewhat of a career outside of the Dead, she’s far too photogenic and appealing to the male demographic to get rid of her character (remember, The Walking Dead is commercial entertainment — the laws of big money apply to the creative decisions since AMC Networks is a publicly traded company); hence her tears at NY Comic Con for never working professionally with Steven Yuen on the show again (unless in flashback, of course). Take these guesses for what they’re worth, dear Gore4ers. 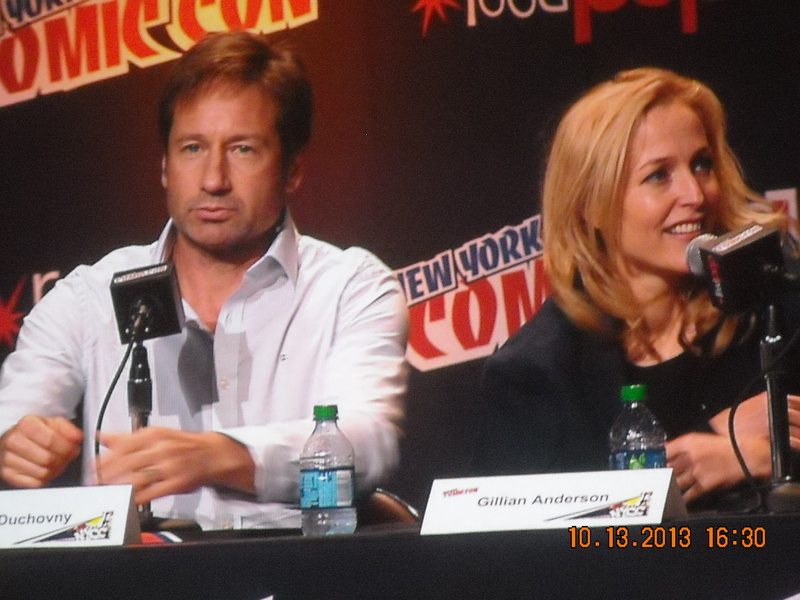 In the meantime, get out your brandy snifters and your cigars because the Season 7 opener promises to be must-see TV. And may all things grue happen upon you this Halloween! Who gets the spikey business end of Negan’s bat? I actually tried, hard as it was, not to think about it too, too much. But I did. Whoever it’s going to be, it will be either a surprise or not, of course. The show has thrown us a few curves before and veered away from the comic, so, for that reason it could be almost anyone. The likely choice is Glenn, but, for the aforementioned reason, it might be any of the others, male or female (with the exception of Rick). I’ve even thought it might be more than one for an as yet unknown reason. Glenn and Abraham? Eugene and Glenn? Rosita and Maggie? Abraham and Daryl? Or any single one of those? Whoever it will be, it’s going to be heartbreaking, simply because these characters have become a part of our extended family. The time to find out is almost here and I’ve been dreading it and looking forward to it. It’s as though going all these months of not knowing has been keeping everyone alive and as long as we don’t know, they’ll stay that way. Once we see it and find out, that one (or two? ), will be gone forever. Like a real death… to all of us. I’ll tip my own scales and reiterate what I said earlier – I’m completely dreading finding out! When you see those eleven people knelt before Negan, they are all cowering, even crying, all that is, except one – Abraham. He’s the only one acting defiantly, looking straight at Negan. If you wanted to send a message to the rest, why not take out the one who seems the strongest – if he can be ended with one, OK, several swings of a bat, then anyone is vulnerable. And that’s the other thing. As mentioned earlier, whoever got bashed, he/she withstood the first swing and sat back up, again, defiantly. Who does that sound like? Most of the group is too injured, too weak, too exhausted to be able to survive that initial hit. The only one strong enough would be Abraham, though, possibly, Glenn would have the inner strength from his love for Maggie and their unborn child to keep fighting. 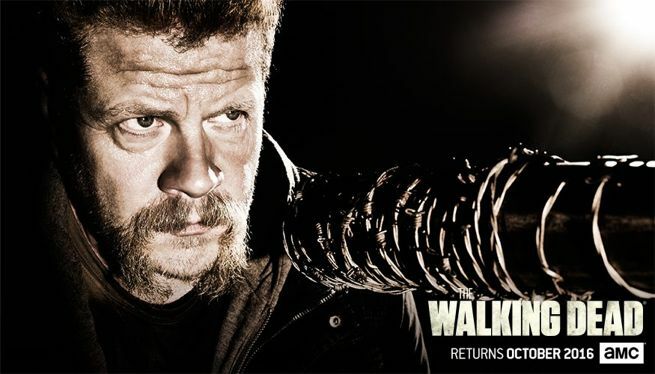 Killing off Abraham would also have the necessary impact on the others due to his recent love triangle with Rosita and Sasha. We know there’s no way Rick is going anywhere. Daryl is too popular and fans would revolt. Negan, smart and observant as he is, might go with Carl or Michonne, realizing their importance to Rick, but I don’t think he’d take out a kid, or a woman. That should also leave Sasha, Rosita and Maggie safe. It would be extremely and unnecessarily cruel to kill a pregnant Maggie, not just from Negan’s point-of-view, but also from the producers’. Would they even dare? – I certainly hope not. Plus, in this day and age where openly misogynistic clowns can run for President of the U.S., and thus, are shedding a light on how we treat, and should treat women, smashing in the skull of a sick, pregnant lady is the last thing anyone needs to see. Eugene and Aaron are both possibilities, but the impact of their deaths would not be as great as it would be from others. 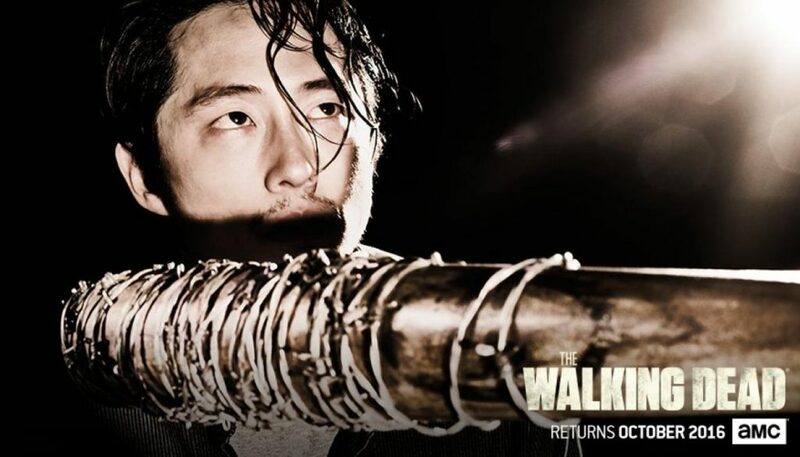 Then there’s Glenn, who has been with the show since the first episode and has survived many close calls. Might his ninth live be up? Hopefully, his previous reprieve at the dumpster won’t be for naught, and he’ll get to enjoy the birth of his and Maggie’s child. At least we can take comfort in knowing that there are other characters – Carol, Morgan, Tara, Father Gabriel, Judith and the survivors from Alexandria still out there, and apparently safe, for now. So, that’s what we think. What about you? 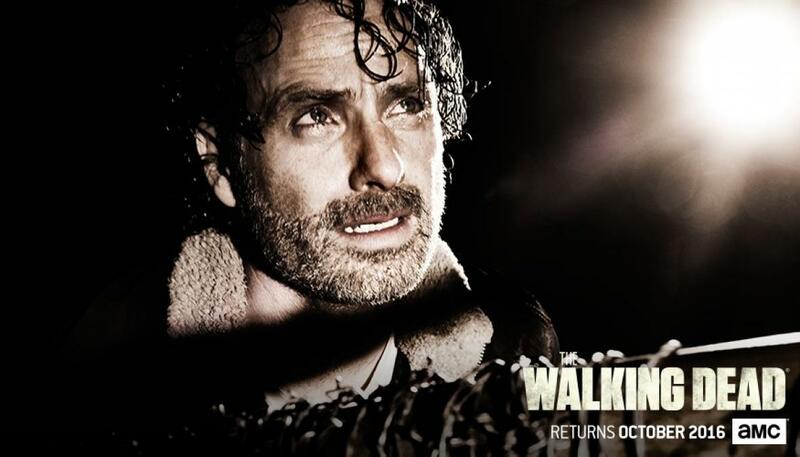 Feel free to give us your predictions, and we’ll all ultimately find out when The Walking Dead returns on Oct. 23rd. Be sure to watch with your loved ones and hold them close. We’ll all need each other in order to get through this together. Dave, while I agree with your picks of Abraham, followed by Glenn, I don’t know if you can go by emotional reactions by actors at Comic Con as giveaways to who dies. I think they’ve all grown pretty close to each other, and it has to be pretty traumatic for all of them to see someone they care about get taken out right in front of their eyes. Yes, it’s the character that is being killed, but that also means the actor won’t be around anymore on the set either. As for Lauren Cohan’s emotional reaction, I remember her being pretty broken up over Scott Wilson’s exit as her father, Hershel, on the show, so who knows. I do give credit to all the actors, who have to give countless interviews, sometimes in front of large audiences, for being able to keep these surprises close to the vest. However, unlike the walkers that present danger at every turn, they’re only human. In my opinion, there will be two red headed victims. On October 23rd Negan and Lucille will slaughter Abraham and on November 8th Hillary and Tim will slaughter Trump. And our joy over the second will help us get over the sadness of the first.